The prankster said his masterpiece would “surpass all monetary value”. Since the new polymer £5 note was released, people have been flogging it all over the place, selling special editions with rare misprints. But some jokers have decided to do one better and make their own limited edition versions of the fiver, just by drawing it themselves. 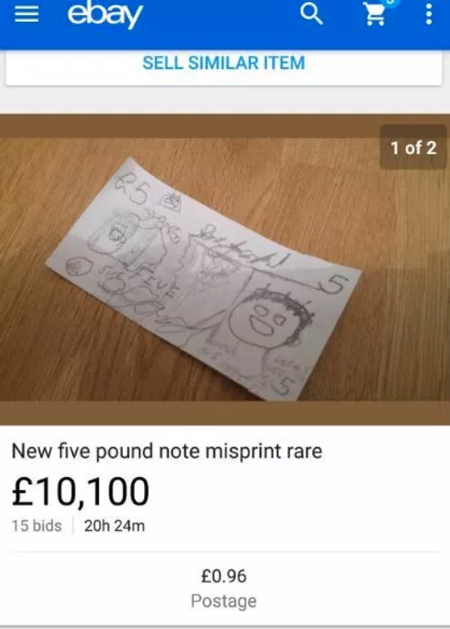 As Lad Bible reports, Adam Purcell from Bournemouth was one such prankster, who managed to raise over £10,100 for his drawing of the note, which he described as a "rare misprint on white paper and graphite ink." And the worst thing was, it was hardly a masterpiece, either! Don't forget the cheeky £0.96 postage either. Luckily, common sense prevailed, and the lot was soon taken down by the auction site. But it hasn't deterred others. It turns out Purcell isn't the only blagger in Britain, as plenty of eBayers have posted their own versions of a £5 note in a bid to raise a ridiculous amount of funds. Well, if people are stupid enough to bid, why shouldn't they be making some money off it?